PXI Chassis, 3U / 6U Chassis - MTS-207 | Marvin Test Solutions, Inc. The MTS-207 is a state-of-the-art portable PXI platform for field testing and data acquisition systems. Its proven architecture has been deployed worldwide on multiple programs including the MTS-206 Maverick Missile system flight line tester, the MTS-209 Common Armament Test Set, the AN/TSM-205B Hellfire System test Set, and many more. It combines the capabilities of the versatile and powerful PXI architecture in a compact, ultra-rugged, flightline qualified enclosure. The MTS-207 is ideal for test and data acquisition applications requiring operation under harsh environmental conditions including flightline, back-shop, or airborne applications. The MTS-207 combines the benefits of PXI with a ruggedized design – offering protection from harsh environments. The MTS-207 includes a shock-mounted, 14-slot, combination PXI chassis with seven 3U slots and seven 6U slots. Slot 1 is used by a 6U PXI controller (2.53 GHz i7 CPU with 4GB RAM). Slots 2 through 7 can accommodate either 3U or 6U PXI/cPCI instruments, while slots 8 through 14 can accommodate 3U PXI/cPCI instruments only. Slots 3 through 14 can be synchronized using a Star Trigger Controller in Slot #2. The MTS-207 can also be controlled via an optional integrated LCD display and touch screen – a Remote Control & Display Unit (RCDU) or via a Tablet PC. The RCDU and Tablet PC allow operation of the MTS-207 from distances of up to 25 feet and eliminate the need for a keyboard or mouse. The MTS-207 can also be remotely controlled via Ethernet by any external device. The MTS-207’s internal circuitry is mounted to the top panel of the unit using four shock absorbers. A fifth shock absorber is mounted on the bottom of the chassis to control lateral movement. The MTS-207 also includes a Power Board which provides power to the PXI chassis and a microcontroller which supports the MTS-207’s Smart features including the monitoring of system power supplies and internal system temperatures. The Power Board can also accommodate optional UUT power supplies, user relays, user measurement channels, and user I/O. Built-in heaters for the PXI chassis and the RCDU allow the MTS-207 to operate in extremely low temperatures. The chassis is hinged, providing access to the Power Board and a relay access door on the front panel allows access to the Power Board’s socket mounted relays for quick maintenance. The rugged fiberglass case can be optionally upgraded to support the EMI/EMC requirements of MIL-STD-461. The MTS-207 includes two standard interface connectors for Input Power and Utilities (display & peripherals). Optional interface connectors can be used for the RCDU and for UUT interconnect (Virginia Panel Clicks or several D38999 circular military connectors). The front panel is customized to the customer’s requirements. Three fan assemblies with four fans each plus an additional exhaust fan provide ample cooling to the PXI chassis and internal circuitry. A removable intake filter prevents dust and other particles from entering the unit. Temperature sensors control operation of the fans with all 13 fans with variable speed control operating at full speed at high temperatures (above 45 °C) and at a low speed at lower temperatures. The MTS-207 is available in various enclosures including wheeled configuration with a tote handle. The MTS-207 is the core platform for Marvin Test Solutions’ portfolio of armament system test sets which employ the same field-proven architecture and compact, rugged design. Based on the flexible, scalable, PXI platform, these state-of-the-art test sets are designed to provide advanced test capabilities with a space-efficient, small footprint, suitable for O- and/or I-level use. 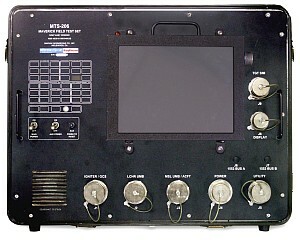 The AN/TSM-205A/B are portable test sets designed to perform full parametric functional test with diagnostics to the LRU level on integrated Hellfire and Longbow systems as installed on the aircraft, as well as testing the entire fire control system from the cockpit switches to the launch rails. The PATS-70 is an automatic test system designed to perform functional tests on the Fairchild Republic A-10C Thunderbolt II’s (A-10) IFF, Anti-skid, Alpha Mach, Stability Augmentation System (SAS), and Fuel Quantity Indicating System. Based on the MTS-207 platform and developed in conjunction with the USAF, the PATS-70 provides the logic and hardware control necessary to coordinate and automate control of these system functions. The PATS-70 is an automated, user friendly, adaptable test set that provides robust system diagnostic capability, significantly reducing the time required to bring an aircraft into mission ready status. With this test set, the USAF now has a flexible maintenance and sustainment solution capable of accommodating additional test instrumentation into the system as future test needs evolve for the A-10/C or even other aircraft.